Fusion power has seemed like science fiction — a boundless energy source that would light up the world forever, if only we could figure out how to contain it. And yet we’re always about thirty years away from solving that mystery. Until now. Recent advances in magnet technology have brought fusion a little closer to the present. MIT researchers have just unveiled designs for a compact, tokamak (donut-shaped) fusion reactor that uses new, barium oxide-based superconductors to produce powerful magnetic fields capable of confining a fusion reaction. The reactor, which is about half the diameter of current models, could in theory produce enough electricity for 100,000 people. Best of all, the researchers say the concept could be realized in a decade. Fusion, the nuclear reaction that powers the stars, occurs when hydrogen atoms slam together at extremely high temperatures to form helium. These atomic handshakes are accompanied by a tremendous release of energy, which becomes self-sustaining at very high temperatures. But the challenge has always been confining the hydrogen plasma, which is as hot as the core of the Sun. 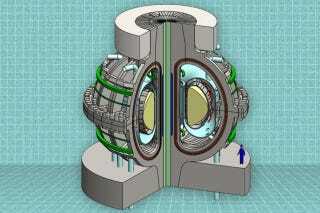 Powerful magnetic fields seem to be the answer, but traditionally, we’ve needed very large reactors to produce them. The proposed reactor, described in the journal Fusion Engineering and Design, would capitalize off the exceptionally strong magnetic fields created by rare-Earth superconductors to produce more sustained fusion power in a much smaller reactor than ever before. The researchers say the new magnets can output about 10-fold more power than standard superconducting technology, and they can run for sustained periods of time without frying (unlike today’s copper coil-experimental reactors, which can only run for a few seconds). Another key upgrade: Most of the solid materials used to insulate the fusion chamber have been swapped for liquids that can be drained off and replaced like an oil change. This, the researchers say, will reduce the need for expensive and time-consuming replacement procedures — and that’d go a long way toward making fusion cost-effective. So far, no fusion reactor, not a one, has been able to produce as much power as it consumes. This fact is obviously a bit of a bummer when we’re talking about the most promising renewable energy source imaginable. I’m still of the “I’ll believe it when I see it” mindset when it comes to fusion, but it’s heartening to know that we’re making progress. Between mini star reactors, underwater fences that harvest tidal energy, and wind-powered island nations, the future is finally starting to look a bit greener.